D L CO NO XXXIII (1943) The 562 ton 128 foot wooden barge D L Co No XXXIII foundered January 23, 1943 off Four Mountains Island near Inanudak Bay on Umnak Island. DAE RIM (1981) The 291 foot Korean cargo ship Dae Rim caught fire and washed ashore February 28, 1981 at Cape Wrangell 90 miles west of Attu in the Aleutian Islands. 24 crewmembers were lost and only two survived. DAITO MARU NO 55 (1981) The 105 foot Japanese trawler Daito Maru No 55 was lost with all hands March 13, 1981 approximately 380 miles northwest of Adak. 26 crewmembers perished in the disaster. DAN PRINCE (1980) The 46 million dollar oil drilling platform Dan Prince sank in 16,000 feet of water while under tow October 22, 1980 approximately 300 miles southeast of Dutch Harbor. All 18 crewmembers on board were rescued. DARK STAR (2002) The 43 foot longline halibut fishing vessel Dark Star struck a submerged object and was abandoned June 13, 2002 about eight miles west of Spray Cape northwest of Unalaska. All three crewmembers were rescued with the help of the U S Coast Guard and the fishing vessel Republic. DAUNTLESS (1980) The 58 foot limit seiner Dauntless stranded and was lost December 1, 1980 at Ulakta Head on Amaknak Island just north of Dutch Harbor. The vessel was newly built and on her maiden voyage. No loss of life was reported. DEBRA D (1997) The 102 foot fishing vessel Debra D caught fire while moored at Magone Marine in Dutch Harbor January 1, 1997. There was no one aboard the vessel. The bridge and accommodation spaces were completely destroyed and the vessel was declared a total constructive loss. The source or cause of the fire was not determined but appeared to be electrical in nature. The Debra D was completely rebuilt and put back into service as a fishing vessel in Alaska. DEEP SEA PRODUCER (1988) The 164 foot trawler (converted tug) Deep Sea Producer flooded and sank November 29, 1988 approximately 30 miles west of Unimak Island. All eight crewmembers were rescued from a life raft by the fishing vessel Royal Sea. DELLWOOD (1943) The 3,923 ton 320 foot steam ship Dellwood struck a submerged pinnacle and sank July 19, 1943, 190 degrees true from Alexai Point, Attu Island. The vessel was laying fire control cable between Attu and Shemya when the disaster occurred. No lives were lost. 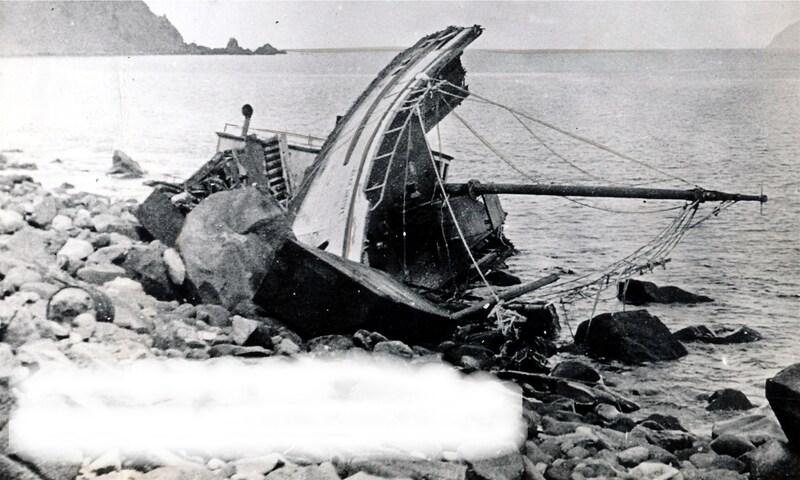 DEVIL SEA (1978) The 44 foot vessel Devil Sea stranded and was lost November 3, 1978 on Igitkin Island near Grand Sitkin Islands in the Aleutians. All four crewmen all made shore in survival suits and were rescued by the U S Coast Guard cutter Ironwood. DIMITRII (1803) The Russian transport vessel Dimitrii was wrecked near Umnak October of 1803. She was on at trip from Okhotsk to Kodiak at the time of the loss. The crew and cargo were saved but the Dimitrii became a total loss. DONBASS (1946) The 10,488 ton Russian tanker (lend/lease ship) Donbass broke in two in a storm February 17, 1946 approximately 40 miles south of Adak. The front half of the ship was located by three Russian rescue ships who removed 15 survivors and much of the ship’s stores. The aft section of the ship was located and assisted by the American tanker Puente Hills who removed 23 Russian crewmen and women before towing the stern of the Donbass to Port Angeles with another 20 Russian sailors still aboard. Both sections were eventually scrapped. DOROTHY (1943) The 42 ton 50 foot wooden scow Dorothy foundered January 10, 1943 at Fort Glenn. DULCINEA (1956) The 622 ton 166 foot steel oil screw tanker Dulcinea stranded and was lost October 9, 1956 on Buldir Island in the Aleutian Islands.